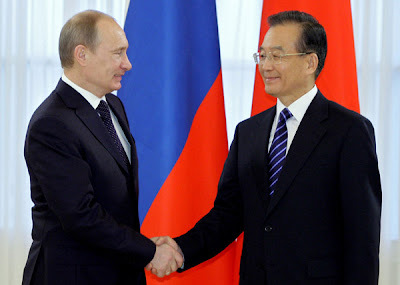 Russia and China Will "Never Become Each Other's Enemy"
For more than 40 years US foreign and military policy has been based on the premise that Moscow and Beijing are rivals to be played off against each other. But what happens if America's main adversaries form an alliance? Where does America turn, when two of the worlds major military powers unite? My premise is that Moscow and Beijing have been allies all along. Whether I'm right or wrong, there can be no doubt that they ARE ALLIES NOW. How long before Russia and China strike with "one closed fist" at the "main enemy" the United States of America? The documents covered cooperation on aviation, railroad construction, customs, protecting intellectual property, culture and a joint communique.